From the sound of 1949 on the A-side to the sound of 1948 on the flip… and early 1948 at that! Such was the perils of sending out a surefire hit in the weeks immediately following the lifting of the recording ban. Oh well, like breaking into your junior high school with your buddies the summer after leaving the eighth grade for a nostalgic walk around the empty halls to peer through locked doors into the quiet classrooms you once had buzzing, I suppose this offers us a chance to take one more look back at what we’re now leaving behind in rock ‘n’ roll. A lot of times these far-fetched analogies I choose to open these reviews are just a way to test your indulgence before we get to the analysis of the song itself… either that or I’m paid by the word… but in this case, well I suppose it’s still pretty far-fetched, but not altogether inappropriate. The interesting thing about junior high and rock ‘n’ roll in ‘47/’48 is the bubble they each exist in, as if they’re both not part of the larger world. In junior high you’re no longer a child but not anywhere close to having independence, so while you possess more freedom of movement away from the constant supervision of adults you can’t exactly get very far. Yet within that bubble that parents can see into but never seem to penetrate you can be kings (and queens) of your own destiny, collectively creating a world unto itself with its own rules and standards and a firmly established hierarchy that seems unshakable while you’re in it. In rock ‘n’ roll’s first two calendar years (16 months really, but who’s counting) things were much the same. These artists existed in their own realm, acknowledged by – yet simultaneously dismissed by – the older established music world, emboldened by their comparative freedom from adhering to musical precedents and constantly testing authority with their brashness. But because the audience for it was still a fairly small constituency rock seemed to be tethered to a leash, unable to move quite as fast or as far as they wanted. But we know what happened, like the difference in worldliness for those stuck in seventh grade compared to those who’ve reached eighth grade, before long rock too began to start hitting parties, breaking curfew and having their first experiences in getting drunk, getting laid and getting seriously reprimanded for it all, which only brought it even more notoriety amongst its envious and impressed peers. Rock ‘n’ roll circa 1948 was the story of a kid entering eighth grade… already witness to a few eye-opening experiences as seventh graders in 1947 but still largely unprepared for what awaited them. Over the course of the upcoming year the class evolves, some students rapidly maturing as they claw their way up the social ladder while others seem unsure of how to handle the transition and remain stuck at the bottom, claiming it doesn’t matter that they aren’t popular, that their clothes are out of fashion and girls aren’t aware of their existence, but all the time wishing they were moving up in the world too. You look around the school and see the pecking order start to emerge with the brash Wynonie Harris quickly taking on the role of the campus king (as if there was ever any doubt about that). Roy Brown is the unquestioned top jock in school and carries himself with the casual confidence of one who is always assured to be picked first in gym class, knowing that the girls will be hovering around him admiringly for years to come and is already taking it in stride. You also note the gradual emergence of some kids like Amos Milburn and Andrew Tibbs who started the school year on the outskirts of popularity before coming into their own, maybe by sitting amidst other cool kids in one or two classes and being pulled into their orbit. By year’s end they’ll find themselves among the leaders of the school, orchestrating the social activities for the weekend from their hallowed spots at the popular table in the cafeteria. Paul Williams sat at that popular lunch table all year. His status was never in doubt from Day One but to those still awestruck by some of his more intimidating running mates Williams seemed more approachable by the peons of the class. Laid back, modest, non-threatening, yet consistently admired no matter what he did. Now that Williams had moved on to high school in 1949 – the larger world with fewer restrictions as to just how far you can travel – with The Hucklebuck, we take this opportunity to flip through the pages of last year’s junior high yearbook to see what he was like as 8th grade kicked off. His shoulders narrower, his face smoother, his features not quite as hardened, the Williams of Hoppin’ John is familiar by sight, but it’s plainly obvious that just a year later he’s outgrown those clothes and that image. 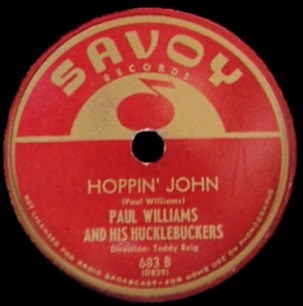 As appropriate for a song cut in December 1947 there’s still plenty of evidence as to a more confined approach on Hoppin’ John. The opening in fact has you wondering if maybe this was a leftover from their sixth grade school year with its massed big-band type repetitive riff followed by a smoky jazz-like standalone spot in front of barely audible drums, piano and string bass. It’s Wild Bill Moore in fact on tenor out front and eventually he cuts loose a little before Williams jumps in with added grit and passion. At their best these two worked off one another with a subliminal language all their own… to keep the junior high analogy going they were like best friends whose slang and shared experiences made them seem interchangeable to outsiders. Each one is satisfied to stick to their roles, not emphatically trying to outdo one another with their lines so much as to propel each other higher. As the record goes on they ramp up their volume, hitting higher highs and ripping off some more guttural lows and their interplay not only forms the most exciting passages here, but also the most technically impressive. One of the most notable things about junior high looking back is how certain kids seemed much more mature than those who clung to the safer attributes of their younger, childish, recent past. So too with rock, as guys like Williams and Moore appear far beyond the simple musical features around them. They’re itching to grow up even faster, anticipating the day when they can jump behind the wheel of a car and take off on decedent adventures with their pals, while their band mates here are hoping to slow down that progression and remain bike-riding playground dwellers for a little while longer. Luckily, as always happens, those more timid kids are increasingly shunned, doomed to remain stuck in the netherworld of the seventh grade outlook until early adulthood. Meanwhile Williams and Moore are the ones who are the first to try seemingly everything your parents warned you about. In musical parlance that means they’re trying to get you to lose your inhibitions the raunchier they play their horns and considering their inexperience they aren’t half bad. A little awkward and clumsy at times, but with enough eager determination to make up for it. But as anyone who’s passed through the teen years knows, there’s a big difference between that uncertain behavior at your first unsupervised parties and the confident assurance you’ll have a few years down the road in any of the hundreds of high school benders that make up your weekend nights for the next few years. In other words their performance is still lacking something, especially to our ears that have become attuned to later developments on the rock saxophone circuit, including further efforts by the two of them we’ve already encountered months ago (The Twister by Williams with Moore guesting and We’re Gonna Rock featuring the same two names with merely the credits reversed). Had we heard Hoppin’ John back in December of 1947 when this was cut or in the first two or three months of 1948 our reaction to this would surely have been much different. Much better in fact. The context of that period would’ve made the relatively tepid backing not stand out as a detriment quite as much, allowing us instead of focus more on its bracing tempo as it goes along and by the end the animated playing style they’re exhibiting would’ve seemed much bolder. Not anymore. No self-respecting kid just entering high school would want to put on the clothes he wore on his first day of school in 8th grade and no self-respecting sax player who’d seen the instrument’s role hit an unprecedented growth spurt over the past year wants to be measured against the far more modest heights they reached way back then. What’s missing isn’t just the higher octane fuel rock instrumentals have come to use, but also the repetitive hook-based melodic structure to run it on. Hoppin’ John is little more than a series of escalating riffs, each more than decent enough on their own to capture your interest, but when strung together they can’t fully sustain that interest for long. More uncontainable excitement over merely breaking the rules for the first time as opposed to the measured self-assurance you’ll soon learn when rule-breaking becomes standard operating procedure. Your primary reason for sticking with this in spite of its wandering direction is because by 1949 you’re invested in the career trajectories and musical progression of Williams and Moore and you want to see if you can get any indication as to where they were headed a year earlier. To a degree you can. Like looking back through the junior high yearbook you CAN see signs of their budding personalities and rising stature, but they’re both still works in progress – endowed with the right instincts as to how to reach their goals of lasting popularity (or shallow notoriety depending on your viewpoint) but still unsure of how to guarantee they achieve their aims. It was there in front of them now but for awhile longer it was still just out of their reach. Like the kids traversing the ever shifting ground of junior high the path laid out ahead of them by the adult establishment had seemed pretty simple and straightforward. Pay attention in class, get good grades and prepare for the real world, OR in their case, adhere to the time honored styles, play “good” music and aspire to a steady career in a conventional band. But in both junior high and rock ‘n’ roll we know that’s never the most alluring path to take. All of the day to day events that make up the really crucial learning experiences of a kid’s real education take place outside of those controlled confines… in the moments before the teachers establish order at the beginning of each day… in the brief exchanges with your friends in the hallways between classes… and when school lets out and you’re free to see and talk to whoever you want once the doors open and you’re paroled for the day. That’s the part of junior high you need to conquer in order to make your reputation. In rock music it was no different. Yeah, they could conform to the styles that were already proven, find jobs as the third chair horn in a big band playing stale charts for ever shrinking audiences with no chance at personal glory and when they graduated they’d always be able to earn a reliable living in some anonymous studio band. Or they could venture out into the unknown and follow the most exuberant responses of the equally delinquent audience, rising fast and reveling in their status like only a conceited eighth grade big shot can properly do. They both would choose that flashier road of course and soon after cutting Hoppin’ John they’d be amply rewarded for it. Their hits would begin piling up, their names would be widely known and they’d be the ones setting the trends going forward. It won’t last. It rarely does. The kings of the eighth grade don’t usually wind up in the biggest houses with the best jobs and the hottest wives. Likewise so many of the friendships that seemed certain to endure at the time get broken up by circumstance when you reach high school – different classes, different culture, different terrain to learn how to navigate. Sure enough Williams and Moore wouldn’t record together once they reached high school in 1949 and so this song, though cut almost at the beginning of their partnership as they headed into the eighth grade together, winds up serving as their epitaph. As a record it’s not the best way to go out, sort of a disappointing last day of school as it were. But like the memories of junior high itself you tend to forget the moments like this – the awkward uncertainty of the first weeks when you were still figuring out what to do and where to go as you get your bearings – and instead when looking back you focus on the days you felt like you truly ruled the world. Leave a reply on "Paul Williams: “Hoppin’ John”"